You must create an MST file with custom configuration parameters and use this MST file to deploy the Veeam Availability Console management agents on client computers. The management agents will use parameters specified in the MST file to connect to a cloud gateway on the service provider side. Obtain the necessary version of the Veeam Availability Console management agent setup file. 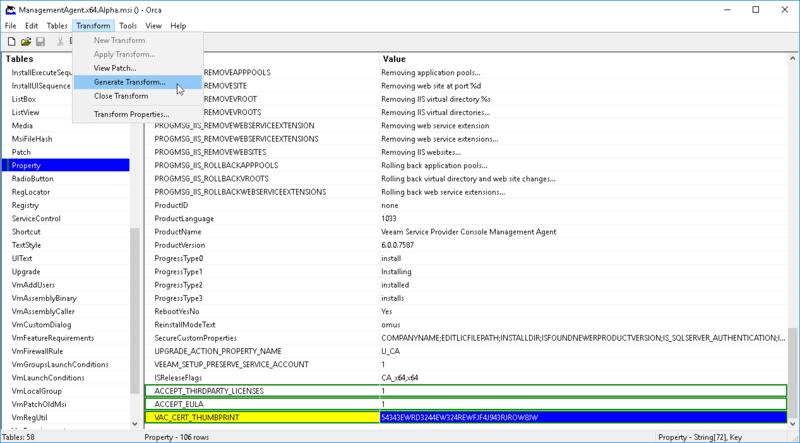 The management agent setup files reside in the C:\Program Files\Veeam\Availability Console\ApplicationServer\AgentPackage folder on the machine where Veeam Availability Console is installed. If you installed Veeam Availability Console using a distributed installation scenario, check this folder on a machine where the Veeam Availability Console Server component runs. In the command prompt, run a command to start the Veeam Availability Console Communication Agent wizard. At the Network Location step of the wizard, specify a directory to which setup files must be unpacked. Copy the unpacked files to a network share. The network share must be accessible from all client computers on which you want to deploy the management agent. Make sure you set at least Read permissions on the files. In the directory with unpacked setup files, locate the management agent setup file and open it for edit with Orca. For details on Orca, see Windows Dev Center. In the menu, choose Transform > New Transform. In the Tables pane, click Property. ACCEPT_THIRDPARTY_LICENSES — specifies if you want to accept the terms of the license agreement for the 3rd party components. Specify 1 if you want to accept the terms and proceed with installation. ACCEPT_EULA — specifies if you want to accept the terms of the Veeam license agreement. CC_GATEWAY — FQDN or IP address of a cloud gateway. VAC_TENANT — user name for connecting to the service provider. VAC_TENANT_PASSWORD — password for connecting to the service provider. You must specify credentials of the Company Owner. VAC_CERT_THUMBPRINT — thumbprint of a certificate that is installed on the Veeam Cloud Connect and Veeam Availability Console servers, and used to secure traffic between the service provider and clients. The thumbprint is used to verify the authenticity of the certificate. Although this property is optional, it is recommended that you specify it. If you have changed the default port number when deploying the cloud gateway, locate the CC_GATEWAY_PORT property and change the port value. For details on the gateway port configuration, see Adding Cloud Gateways. In the menu, choose Transform > Generate Transform. Save the MST file with configuration details. Copy the MST to a network share. Make sure you set at least Read permissions on the file. Right-click the OU which includes computers on which management agents must be deployed, and choose to create a new Group Policy Object. Right-click the Group Policy Object and choose Edit. 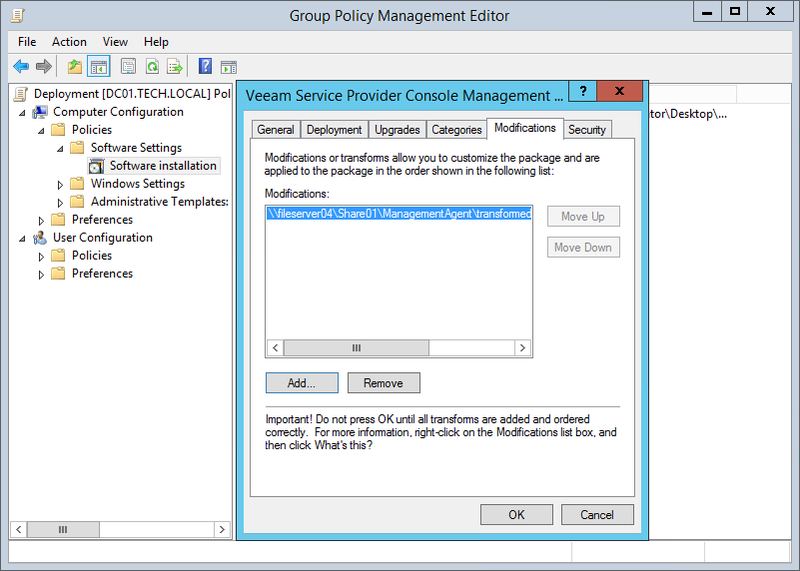 In the left pane of the Group Policy Management Editor, expand Computer Configuration > Policies > Software Settings. Right-click Software Installation and select New > Package. 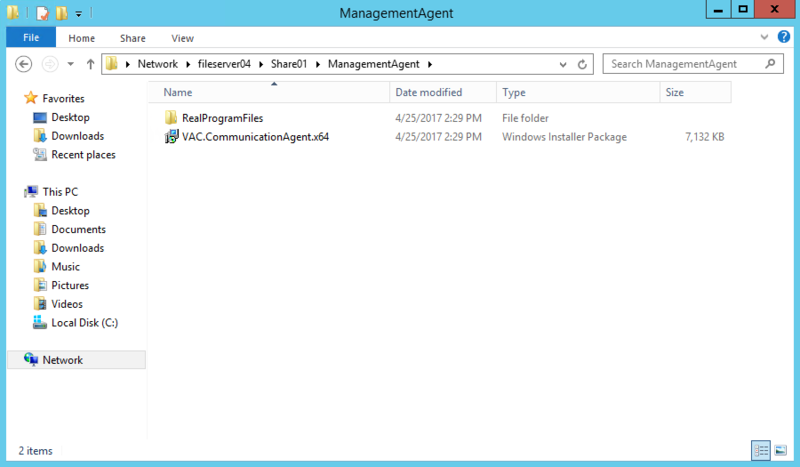 In the Open window, point to the management agent setup file located on the network share. This must be the setup file obtained as a result of installation in the administrator mode, as described at Step 1.1. In the Deploy Software window, choose the Advanced deployment method. Open the Modifications tab, click Add and choose the MST file located on the network share. In the left pane of the Group Policy Management Editor, expand Computer Configuration > Policies > Administrative Templates > System > Logon. Right-click the Always wait for the network at computer startup and logon policy setting and choose Edit. In the policy setting window, select Enabled and click OK. Apply the created Group Policy to client computers.